Washington still counts him as part of its axis of evil, but Europe and Russia — and, more recently, even archenemy Israel — are courting him as a negotiating partner. The ruler of Damascus, Syrian President Bashar Assad, wants to lead his country back to the international community. Bashar Assad will never be a charismatic politician like Barack Obama or a populist leader in the style of Fidel Castro. Forced into politics by his über-father, Hafez Assad, the “Lion” of the nation, the 43-year-old former ophthalmologist consistently comes across as stiff and awkward on the international stage. He always gazes into the distance during public appearances, as if he wanted nothing to do with politics and would much rather be someplace else. Even today, after leading his country for eight years, Assad still gives the impression that he longs to return to treating patients in his former practice in London or attending an ophthalmologists’ conference. At state receptions, the tall president stands stiff as a board, as if he had swallowed a giant pencil, shifting his weight from one leg to the other, a lost flamingo in the palace of power. But anyone who sees Assad as a political lightweight, as someone easily manipulated by his advisors and a marginal figure ridiculed or at best ignored by the major players on the world stage is making a mistake. Syria is in the process of becoming a decisive force in the Middle East once again. This is partly the result of the important role Damascus plays in regional politics, with its special contacts with neighbors Iraq, Israel and Turkey. But Assad also deserves some of the credit. When the spotlight he so dislikes is turned off and he embarks on discussions with the powerful in the smallest of groups, Assad no longer comes across as absentminded and wooden. Instead, he seems focused and reveals himself as a clever strategist who pursues his objectives and only suggests a willingness to be conciliatory when he has no other options. Karim Aga Khan IV, the spiritual leader of roughly 20 million Ismailites worldwide, is visiting the Syrian capital Damascus. The Ismailites, who live primarily in the Middle East, East Africa, Central Asia and on the Indian subcontinent, often constitute the social avant-garde. The Shiite community is also an influential minority in Syria. The Aga Khan Development Network is the world’s largest private aid organization, and the man who founded it, 71-year-old Aga Khan, is considered a leading representative of moderate Islam. Its his personal relationships with political and business leaders in the West and the East as much as his billions that make him a much sought-after advisor. 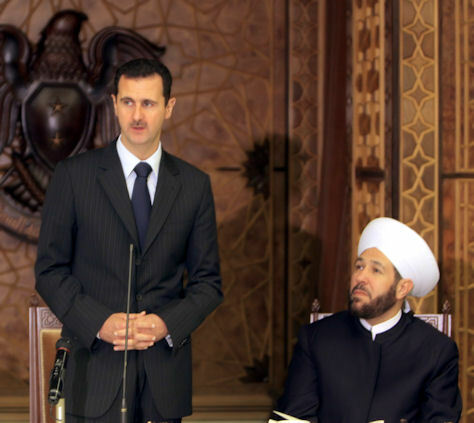 The visit to Damascus is the imam’s fourth meeting with Assad in recent years. But the Aga Khan’s visit is only one of a series of meetings with world politicians. The Syrian president is suddenly being wooed internationally. At the invitation of French President Nicolas Sarkozy, Assad attended the European Union and Mediterranean Summit in mid-July, where he met with German Chancellor Angela Merkel. He also attended the annual Bastille Day parade in Paris as a “guest of honor.” In early August, he traveled to Tehran to discuss the escalation in the nuclear weapons dispute with Iranian leaders. In late August, after the Russian military’s combat operation in Georgia, which he described as justified, he made a state visit to Moscow, where he negotiated with President Dmitry Medvedev over the expansion of a Russian naval base in Syria and Moscow’s delivery of state-of-the-art weapons systems to Damascus. As SPIEGEL has learned from intelligence circles, Syria is considering stationing “Iskander” ballistic missiles — as a direct response to the systems Washington plans to install in Poland and the Czech Republic soon. The Israelis responded with concern to the news of new weapons shipments. Nevertheless, they have not discontinued the talks currently underway between Jerusalem and Damascus, with Turkey serving as the middleman, and in which, as insiders report, astonishing progress is being made. Regaining the Golan Heights, which Israel occupied in the 1967 Six-Day War and later annexed, is the chief goal of Syrian foreign policy. In return, Damascus could be willing to renounce violence and possibly even recognize the Jewish state. The only major players absent from the ranks of those wooing Assad are the Americans — for now. The government of President George W. Bush and Vice President Richard Cheney, which defines Syria, along with Iran and North Korea, as a “rogue state,” probably lacks the power to make an about-turn in its relationship with Damascus. The economic sanctions Washington imposed in the spring of 2003 are still in force. But Democratic presidential candidate Barack Obama has already offered Syria talks without preconditions if he wins the election in November. Assad is currently celebrating an astonishing comeback on the international stage, especially in light of the humiliations he and his country suffered not too long ago. Less than a year ago, Assad was still a pariah. In September 2007, Israeli fighter jets, in flagrant violation of international norms, bombed a military facility deep inside Syrian territory. The attackers claimed that it was a reactor used to produce weapons-grade materials, a North Korean-Iranian-Syrian joint venture. The Syrians said it was a conventional military facility, and yet they were noticeably reticent when it came to voicing anything resembling sharp protests or threats of revenge. Syria, at the time, was considered practically leprous. Only a few months ago, German Foreign Minister Frank-Walter Steinmeier offended officials in Washington and his own chancellor when he proposed entering into talks with Assad. When the Americans argued that Syria had allowed suicide bombers to slip into Iraq to attack US troops there, Assad remarked that it was an unfair accusation, especially considering that even the United States is incapable of completely sealing off its border with Mexico. Even more serious was the accusation that Damascus had been involved in the murder of leading Lebanese politicians Rafik al-Hariri in February 2005. The United Nations investigation headed by Berlin Public Prosecutor Detlev Mehlis suggested that senior Syrian politicians were at least aware of the plot, but subsequent investigations fizzled under Mehlis’s successors after the German withdrew from the commission. Assad has now defused the still-unsolved murder case by agreeing to a concession. Despite Damascus’s past treatment of Lebanon as more or less an extension of Syrian territory, a place where its intelligence agents could do as they pleased, the president will now formally recognize the cedar state. He offered Beirut the exchange of ambassadors, but only after it had become clear that the powerful Hezbollah militias, funded by Syria and Iran, would not be disarmed and that its representatives would be given veto power in the Beirut government. Is Assad truly a moderating force in the Middle East today, a man transformed from agitator to peacemaker — like Saul who, according to the Holy Scriptures, transformed himself into Paul as he traveled to Damascus in Biblical days? Can Assad, with his track record as an authoritarian leader, use his foreign policy successes to turn his country into a Middle Eastern model of democracy? Or is he still a dangerous adversary who is merely maneuvering? The scene is a plush, discreet café in Damascus’ Old City, not far from the Omajjaden Mosque, in the middle of the “paradise of the orient,” the traditional realm of the “bride of all cities,” a place adored by poets and authors throughout history. Yassin al-Hajj Salih, a 47-year-old doctor, loves this Damascus. As a young man Salih, a leftist, sought to unhinge the system with his fiery communist speeches. Hafez Assad had him arrested in 1980. He spent 11 years suffering in prison without any charges having been brought against him, and he repeatedly refused to renounce his ideals. He was eventually sentenced to 15 years in prison, as well as an additional year for “bad behavior,” to be served in Tadmur Prison, a place notorious for torture. “Our Guantanamo,” Salih calls it. After his release, Salih summoned up his remaining strength to finish medical school, and began a relationship with a woman who had also been in prison for many years. Like many Syrians, he believed in the “Damascus Spring” of 2000, when Bashar Assad came to power after his father’s death and promised more pluralism. “We were certainly naïve,” says the civil rights activist. Within a year of the new president coming to power, the arrests began again. Criticism of the government had become too vehement and fundamental for the younger Assad’s taste. Salih was summoned by Syrian intelligence almost monthly and “warned” about critical articles he was publishing in a Lebanese newspaper. “It is true that there is less torture under Bashar than under his father,” says Salih. But he also fails to recognize any signs of political liberalization, pointing out the government’s recent treatment of regime critics, like the arrest of former businessman Riad Seif, 62, who was awarded the Human Rights Award of the German city of Weimar in 2003. Since January Seif, who has cancer, has been in prison with other members of an opposition group that had dared to publish a pro-democratic manifesto. In Aleppo, the more than 4,000-year-old trading center in northern Syria, a UNESCO World Heritage Site and the terminus of a branch of the legendary Silk Road, there is also a man who is convinced that he knows what matters to Syrians. “Religious freedom and improvement of living conditions, those things are important,” says Grand Mufti Dr. Ahmed Badr al-Din Hassoun, 59, as he fingers his prayer beads. Hassoun is everything but apprehensive. His English interpreter is an Armenian Orthodox Christian, and his closest advisor is Roman Catholic. Although Syria may still be a police state, religions treat each other with greater tolerance there, unlike in neighboring Lebanon. Minorities enjoy special protections, perhaps because the “ruling family” is part of a minority religious group itself. The Assads are Alawites, a Shiite minority that makes up only 10 percent of the Syrian population. The radical Muslim Brotherhood, considered a threat and brutally opposed by Hafez Assad, is now nothing more than an insignificant, underground splinter group. Hassoun was a member of the powerless Syrian parliament for eight years. Although his fellow Sunnis proposed him for the position of Grand Mufti, he was appointed by the president. Does he believe that this makes him Assad’s mouthpiece? “Absolutely not,” he says. Although he is generally in agreement with the president, says Hassoun, he repeatedly has grounds for criticism. Hassoun and Assad get together several times a year for scheduled one-on-one meetings, and they meet more frequently when special problems arise. The Grand Mufti says that the complaints he hears from citizens often relate to rising inflation, corruption and unemployment. Hassoun, who sees himself as a modernizer, wants his country to open up and investors to come to Syria. “But it must happen gently,” says the religious leader. In Tartus, a small port city and former Phoenician settlement on the Mediterranean, Mohammed S. has completely different problems. An Internet journalist, he is trying to conduct research while avoiding the local authorities. He has chosen to write about a sensitive topic: the recent political murders in Syria. Understandably enough, the man has no interest in seeing his name in print. He works at the risk of his own life. In February, Imad Mughniyah was killed by a car bomb on a Damascus street. For years, there had been rumors that the high-ranking Hezbollah terrorist was living in Syria under a false name, after plastic surgeons had altered his appearance. Mughniyah had apparently long enjoyed the protection of the powers that be. Israeli intelligence was suspected of having performed the strike, which was executed with a high degree of professionalism. Mughniyah had been at the top of the Mossad’s most-wanted list. In early August, Syrian Brigadier General Mohammed Suleiman was shot on the beach near Tartus. The attackers had arrived by sea and used silencers with their weapons. Suleiman was believed to be the head of the secret Syrian weapons of mass destruction program and a close confidant of Assad. He was preparing for a trip to Tehran when he was killed. Mohammed S., the investigative reporter, is firmly convinced that the Israelis were involved. But he also believes that he can prove that precise information about the locations of the two prominent murder victims stemmed from someone close to Assad. But isn’t this an overly bold theory, the notion that Assad cooperated with the Israelis? What could have possessed him to do this? Western diplomats in Damascus have confirmed Shaukat’s removal from power, but Mashaal’s banishment remains unconfirmed. However, Mohammed S. believes that there is a grand plan: Assad complies with Western wishes, and in return he gets loans worth billions and closer relations with the European Union. The journalist has not decided yet whether, and when, he plans to publish his story. And how does the Aga Khan feel about this fascinating, often contradictory Syria, buzzing with rumors? 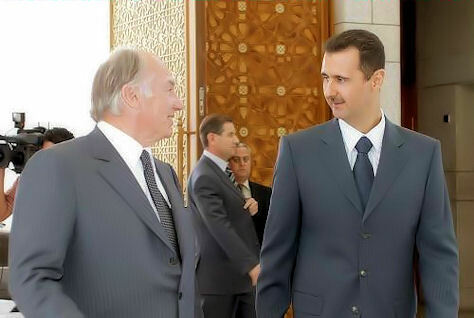 President Bashar Assad with the Aga khan, leader of the Ismaeli community. But will it be possible to “democratize” this country domestically and, in terms of foreign policy, to liberate it from the grip of hardliners in Tehran? “There can be no war in the Middle East without Egypt and no peace without Syria,” former US Secretary of State Henry Kissinger once said. The Syrian president moved up another notch on the international ladder in early September, when French President Sarkozy repaid Assad’s visit to Paris. It was the first state visit by such a high-ranking Western politician in Damascus in five years. The next day, the two men met with Turkish Prime Minister Recep Tayyip Erdogan and the Emir of Qatar. Assad, who described the talks as “highly productive,” suggested that further rapprochement with the West was in the works and expressed his desire for direct negotiations with Israel. But the Syrian president made no commitments. The tide could just as easily shift once again. Thoughts about Saudi Arabia’s constant worrying about Lebanon. This “intellectual” writer used to be Saddam Hussein’s biographer. Now he is in love with the Saudis who hired him. وإذاً فالعودة البشَّارية إلى الجمع العربي وبالذات السعودية ومصر هي المأمونة وتحتاج منه الى انحناءة أخوية تغنيه عما لا نعتقد انه سيفيد حاضرا.. ولا حتى مستقبلا. Plus ça change, plus c’est la même chose for the Saudis. What an utterly naive statement. Since when has any country renounced violence? Otherwise, this article was a bit refreshing. It was clearly not written by an American “journalist”. Mohammed S., the investigative reporter, is firmly convinced that the Israelis were involved. But he also believes that he can prove that precise information about the locations of the two prominent murder victims stemmed from someone close to Assad. Too far fetched, the only thing this guy Mohammed S. will achieve is now every man named Mohammed with the last name beginning in S. is going to be scared to fly into Damascus Int. Khalid Mishaal will be deported from Syria??? Do not bet on it. Syria did not do it when it was completely surrounded, why would Syria do it now when its being courted by so many? And in intelligence matters, it is a fool who tries to attempt -or claims- to fathom what goes on in that arena in Syria. I think the next phase will be an Egyptian meiatation to bring Syria and Saudi together after Saudi playing hard ball paid no dividends. Let us remember that Syria is where it is now because of the Cards it holds, its defiance to surrender, and to the Power it has demonstrated that it can muster not only because it was “dipolmatically” successful. I got a response from my buddy in Google confirming that it’s not just a technical error—Chrome is not made available to computers in Syria to comply with US export regulations. None of Google’s software products are available in Syria … you can search using Google’s SE, but not download Google Earth or Google Chrome. It is 4 o:clock do you know where your money is? Ehsani 2 please enlighten us on whether our retirement funds are going up in smoke. In the meantime Syria has all of its reserves in Euros and other currencies and no dollar, perhaps they are the smartest of the lot. Tongue in cheek, of course, as the Syrian pound is nowhere near becoming a reserve currency. I do owe a reply to you above question and to the other one from few days back. I will answer both of them later tonite or by tomorrow morning at the latest. I am sure that you can recruit a specialist financial advisor who would be able to guard you against adverse hits to your retirement funds. From my vantage point, the financial markets will not stabilize unless and until prices of real estate hit a clear bottom. There is no sign that we are there yet. In the meantime, investors will assume the worst and continue to mark lower the securities underlying the mortgages behind real estate. As those securities fall in value, the need to find new private capital will continue to burden the banking system and their stock prices. Since this private capital is yet to show up to put a floor under these securities, the Treasury has decided to make “public” capital available. Markets work on both fundamentals and sentiment. By the middle of last week, sentiment was so damaged that the need to “do something” became first priority. Politics and some economics will play a part in the way the final version of this bailout will be passed. My bet is that Treasury will have to yield on its original version but will get the proposal passed. Though I am a market participant myself, I do think that lenders must pay for their mistakes and their lax lending standards. In other words, Wall Street must not escape without a significant hit to shareholder equity. This of course means lower values of our retirement funds. It also means very tough access to credit for consumers and businesses alike. In my opinion, financial companies will continue to bleed for years to come. Shareholders will suffer the loss of dividends and capital appreciation. As tax rates rise, municipal bonds (non taxable) will outperform. Your financial advisor may tell you differently, but I think that increasing the share of Muni bonds in your portfolio seems to make sense. Currency markets are notoriously hard to predict. European financial institutions face their own problems. Oil prices may drop as the global economies slow. Were the latter to happen, the US Dollar could actually rise in value against the Euro. House prices nearly doubled between 2001 and 2006. Instead of rising 20% a year, they may have just matched the rise in inflation at say 4-5% per annum. It is therefore conceivable that home prices end up falling by 50% from their peak in 2006-2007. If I am right, there is further downside in the financial markets. As my friend IDAF has heard me say many times, continue to “fasten your seat belt”. Ehani, most commentators are inline with your analysis, but you have raised two points which for me are not clear. You mentioned that future dollar value will rise and the oil prices will drop. It you noticed yesterday spike in the oil prices, contrary to all spectators expectation, and if you consider the demand factor from new players in the world, it does not look to me that price of oil going to drop neither demand especially as long as OPEC control the supply factor. I was really surprised watching the Sheik of Qatar in charge of the Foreign Sovran funds in an interview playing very smart with their money by investing in new markets in Asia and in Gulf States. Dull stupid foreign funds are something of the past and the turmoil in the Wall Street will divert funds from the risky US market, or may be will make it more concentrated in bond market which will drain in the end the financial institutions and stock market. Could you elaborate on these two points please? Second question, have you heard of any expectation when the housing market is expected to bottom up? Observer, your comment about the smarted of the lot, made me wish they were in change of Wall Street as they in charge of Syria Street; they could have saved our retirement? LOL. Oil prices are near impossible to forecast. In previous periods of economic global downturns, oil and commodity prices in general fell in tandem. This period has been exceptional. There is no doubt that China and India have to be blamed but this why we are $106 not at $50 barrel of oil. As you recall, from a high of close to $150, prices tumbled to $90 in the past three months. It is impossible to know whether we make new highs before we make new lows. Currencies are just as difficult to forecast judging by the Euro’s latest fall from 1.60 to 1.40. As to sovereign wealth funds, I think that they are still ill prepared to make significant “majority” stakes in global companies. To do so, requires extensive staffing and a set up that is yet to exist at such funds. As you recall, Kuwait did buy into Citigroup but that was too early (the stocks is sharply lower since). The Singapore wealth fund was luckier by investing in Merrill Lynch which was recently bought by Bank Of America (giving the Singapore fund a quick $1.5 billion profit). As to the expected bottom in US housing prices, please refer to my comment above. In a nutshell, I think that you have to expect further declines due to the large inventory of unsold homes on the market. What you say makes sense. i am just not sure everything is happening is making much sense. Do you agree that sentiment will probably play a positive role on the US economy, dollar and financial systems if Obama wins the elections? and vice versa if Mccain wins? where do you think the bargins are to be had? or is it too risky to say? This sounds too much like local Saudi media..
As I was saying earlier, the value of the Dollar “rose” against the Euro during the time that Lehman collapsed because investors downgraded their “global” economic outlook. As that took place, commodity prices fell. The Dollar exchange against the Euro is inversely related to commodity prices. The lower oil prices go, the higher the Dollar value against the Euro. This has been the way the Foreign exchange market has traded of late. As to the Presidential elections and their impact on the economy, I believe that investors are more worried about finding a bottom in housing prices than who the next President is. The main impact of an Obama versus McCain presidency is likely to be on certain sectors of the economy versus others. Upper income brackets may face higher tax rates under obama. This may increase the value of Municipal bonds. Health care is another area that will see significant change if Obama wins. Defense minister and Labor Party chairman Ehud Barak will demand from prime minister-designate Tzipi Livni that he conduct the negotiations with Syria if she forms a government. Labor sources also say Barak will demand to be fully involved in all aspects of the talks with the Palestinians. Labor’s Knesset faction will meet Thursday morning to formulate its demands in the coalition negotiations with Kadima, which are expected to start after the Rosh Hashanah holiday next week. Barak will present the faction members with the main points from his meeting Wednesday with Foreign Minister Livni. She promised Barak a full and sincere long-term partnership in “managing the affairs of state” and retaining Labor’s position as a senior partner in the government. Meanwhile, two of Livni’s most trusted advisers, attorney Yoram Raved and former cabinet secretary Yisrael Maimon, met with Meretz leaders to discuss their joining the new coalition. Meretz is also expected to decide today to officially open coalition negotiations with Kadima. Shas chairman Eli Yishai also appointed a team to conduct talks with Kadima, and instructed it not to compromise over child allowances. Yishai ordered the team to discuss only social matters, and not deal with foreign-policy issues. A senior Shas source said the coalition talks are no guarantee that Shas will in the end join a Livni government. “The appointment of the team does not mean the negotiations with Livni have become easier. The instructions they received were unequivocal – not to concede anything,” the source said. It seems Livni has decided to form a cabinet with Shas and Labor, senior Kadima sources said Wednesday. Because of the extremely close primary results and Kadima’s internal problems, Livni understands she is not in a strong starting position if early elections are called. So she prefers to take advantage of the opportunity to become prime minister, said a senior Kadima source. Barak has yet to formally inform Livni of his demands in detail, but he is expected to do so as part of the negotiations between the two over forming a new government. Barak feels the defense establishment must play a more central role in the negotiations with Syria, said a senior Labor Party source, due to the security implications of such a peace agreement. It is impossible to conduct the Syrian channel in an “easy way,” said a Labor Party source, implying that the manner Prime Minister Ehud Olmert managed the present indirect talks with the Syrians was not appropriate. Olmert used senior officials in the Prime Minister’s Office – his former chief of staff Yoram Turbowicz and adviser Shalom Turgeman. Barak made it clear to Livni yesterday afternoon that he will not ask her to fire Justice Minister Daniel Friedmann, but he is firm in his position not to allow Friedmann to continue to harm the justice system. He says all future changes in judicial institutions must be made with Labor’s assent. In addition, Labor will demand the opening up of the budgetary framework. Transportation Minister Shaul Mofaz’s supporters in Kadima are demanding that Livni appoint him as her deputy and foreign minister. Tourism Minister Ruhama Avraham Balila and MK Ronit Tirosh, both Mofaz supporters, met with Livni and told her that to unify the party after the primary, she should award Mofaz the posts because half of Kadima supports him. Mofaz has yet to decide whether to return from his vacation, and may discuss a decision at a Rosh Hashanah meeting this evening in his home to thank key supporters for their support. I agree fully with the appraisal of Ehsani 2. No one knows into which territory the US and the world economy is moving into. The lenders that used subprime mortgages have sliced these into financial instruments and many US and foreign insitutions acquied these and are now left in default. One town in Norway which invested in such smoke and mirror schemes is now bankrupt and many outside banks have invested in these or have lent money to US banks. No one knows how much risk each institution has. This creates a crisis of confidence the basic rule of the financial system. The taxpayer may very well be bailing out the Nomura Bank in Japan who invested in Bear Stearns for example. Also if the prospects that the US treasury will not be able to honor its obligations no one will be willing to lend money to Uncle Sam or to buy T bonds. This means a run on the dollar which in my humble opinion will fall by about 20-30%. Now the treasury can print money and then inflation will hit and we will have a Jimmay Carter Stagflation. In contrast to the other times, we have a much deeper deficit and a huge war expenditure. China and others will no longer fund those follies. I sold 90% of my stock when the DJ hit 14200 and kept it all in a guaranteed Money Market with no Mortgage investments at 5.25%. The company is TIAA CREF and it uses 25 billion of liquid assets per year to guarantee its other investments. One last thing I can do is to divide it up into portions of $ 100 000 and put each in a different institution and have it FDIC guaranteed. My appraisal is that even that may not guarantee that the FDIC will have the money to bail out every one that has such a distribution of retirment funds. I also bought Euros when the dollar was worth 1.3 Euros and not 60 or cents as it is today. I also got rid of my mortgage and have no debt whatsoever. No credit card no car no house payment no nothing. While I am very disappointed in what Barak has done to Labor, and hold him personally responsible for it, if there is no choice but to involve him in the next government, then it may not be such a terrible idea to have him partake in the negotiations with Syria (as Defense Minister). He already has two sessions from the 90’s with Farouq al-Sharaa, and knows the material very well. If Livni is to ever present a draft agreement to the Knesset, or certainly to the people of Israel, it may help to have Barak being the chief “architect” for the Israeli side. Despite his misjudgments in the past (unilateral withdrawal from Lebanon, Camp David, etc.) most in Israel still see him as a professional “General” who understands our security issues as well as anyone else if not better. Then again, Bibi will undoubtedly tear him apart with examples just like Lebanon 2000, trying to make the point that rewarding terrorism or a terrorist-supporting state will only bring about further violence. But Livni does lack security-experience, and needs someone trustworthy to negotiate (and later market) this entire realm which, to Israelis, is the most important one. Wow… Observer should dispense more of his financial advise around here… as valuable as his observations usually are, his financial acumen seems much more rewarding and urgently needed at the moment…!! And his ability to hit everything exactly on peak… the Dow Jones, the Dollar, the Euro… Amazing…!! How about getting together with Ehsani and setting up a mutual fund or something that all your hapless colleagues on SC can participate in…?! Observer needs to hit the trading desks of wall street in a hurry. Given their troubles, they would bend over backwards to hire a man with such acuman and impeccable market timing. Once Observer accepts this job and starts his mutual fund, I will liquidate all I own, place it in his fund and book my early retirement. Thank you for the compliment and tongue in cheek again, I can assure all of you that I just sit and observe both politically and economically. Lately I have not commented as there is nothing of substance going on outside of the current financial mess. The country is essentially bankrupt and is holding the world in its grip with its predatory practices. God help us if the foreign investment and lending stops. Me and all of my acumen will go down the toilet. 1- Yearly Car registration fees have more than doubled across the board. Cars with 4 litre engines are now subject to a yearly payment of $3250. This is an astounding duty to pay on a yearly basis.The larger the engine the higher the fee of course. When the government official was asked why the fee went up by this much, he said that if “people want to show off by buying cars with big engines, then let them pay the fee”. 2- The second law passed is to do with all illegal dwellings that have been constructed without the appropriate building permits. Citizens are still confused about whether it applies to those constructed after 2003 or for only those from this point on. In the meantime, legal housing units are now at a premium as close to 37% of all dwellings in Syria is supposedly illegal and lack the appropriate permits. How the government handles this hot potato will be interesting to watch. Ehsani … I support the yearly penalty for owners of cars with 4 liter engines. Pollution in Damascus and Aleppo is a serious health risk. Next they should add taxes on cigarettes and Argeeleh … especially argeeleh. IKhwanweb is the Muslim Brotherhood”s only official English web site. The Main office is located in London, although Ikhwanweb has correspondents in most countries. Our staff is exclusively made of volunteers and stretched over the five continents. Ikhwanweb is not a news website, although we report news that matter to the Muslim Brotherhood”s cause. Our main misson is to present the Muslim Brotherhood vision right from the source and rebut misonceptions about the movement in western societies. We value debate on the issues and we welcome constructive criticism. Before taxing cigaretts, would it not make sense to stop the smuggling of it into the country first? Smuggled tobacco is sold in the open. I dont think that german or japanese new cars are the problem and those are not in big number. Financial crisis is obviously more serious as we are allowed to “know”. No more money for lunatic new oil / Israel supporting wars. Maybe the desperate need of “fresh” cash and capital will force USA to take a more serious and neutral position in the Middle East peace negotiations. We live in interesting times. I think it is time for you to get back in , The stock market is going up 20 to 30% next year , and you do not want to miss that. I think with these fees on 4 liters cars Syria is trying to save on gasoline and make the Syrian made cars a good bargain. Cigarettes should be allowed to be imported and taxed modestly , that is the only way to fight smuggling , OK we can put more troops on the Lebanese border. that might help in more than one way. The question that I have may sound naïve to some, but given the financial crisis we are all entitled to some panicking :). Is it true that, anywhere in the world, central banks allow private banks to invest/gamble/play with only 30 percent of its total reserves (i.e. 30 % of the respective saving accounts), and the rest 70% has to be left intact? But it all adds up .. they should try to limit any source of pollution, whichever way they can. By the way, new buses finally started coming this year. I did not copy it in entirety here. This is the sixth in a series of articles examining the lives of the young across the Muslim world at a time of religious revival. No one can say for sure why Dubai has been spared the kind of religion-fueled extremism that has plagued other countries in the region. There are not even metal detectors at hotel and mall entrances, standard fare from Morocco to Saudi Arabia. Some speculate that Dubai is like Vienna during the cold war, a playground for all sides. There is a robust state security system. But there is also a feeling that diversity, tolerance and opportunity help breed moderation…. Here is a new twist on the Suleiman assassination. Does this suggest a motive? VIENNA — Efforts to investigate alleged Syrian nuclear-weapon activities have been slowed by the recent killing of an intermediary working with international inspectors, the top U.N. nuclear official revealed today (see GSN, Sept. 23). The announcement came in the final seconds of this week’s meeting of the International Atomic Energy Agency’s 35-nation governing board, which had just completed a debate over the agency’s investigation into a Syrian facility that U.S. officials alleged to be a nuclear reactor that was destroyed in a Sept. 6, 2007, Israeli air strike. U.S. intelligence officials later offered evidence that the site near al-Kibar was a nearly operational plutonium production reactor intended to fuel a nuclear-weapon program (see GSN, April 25). The U.S. envoy to the agency, Gregory Schulte, today asked ElBaradei to provide “a comprehensive report” on his investigation before the board’s next meeting in November. Schulte criticized Syria for rejecting an agency request to revisit the nation after a June inspection. Agency chief Mohamed ElBaradei, however, asked for patience from the board. The Syrian official was Brig. Gen. Mohammad Suleiman, a Western diplomat confirmed today. Suleiman was shot in the head at his seaside villa on Aug. 2 by a sniper positioned on an offshore boat, Reuters reported last month. ElBaradei also criticized the United States and Israel for failing to notify the agency of their suspicions before the Israeli attack. His report, ElBaradei emphasized, would be prepared when it was complete and no earlier. What happened yesterday in Washington is an excellent case study in negotiations, which we can discuss at a later time. I urge all who are interested to study yesterday’s events because the same twist can “blow up” the tentative backdoor negotiations with Israel (which so far have been conducted with excellent diplomatic craft). The two principal events are what happened yesterday and how the negotiators will resolve it today or in the next few days. I am a little puzzled by the new Republican bail out initiative. Having read the points in the now dead agreement memo from the congressional negotiators, which address several of the problematic issues, I believe that house republicans by trying to go the “insurance route” are basically trying to assure that the bailout goes but with no oversight whatsoever. If banks can not absorb the financial liability from bad loans, how can insurance companies do that. So in the end, the government, which is the ultimate insurer will have to pay insurance only after few premium payments before the impending collaps. As such, the money is no longer a loan from tax payers, but an insurance liability we as tax payers will have to pay to those who will probably make a couple of payment before collapsing (does the word pre-existing condition ring a bell here). This is a bad ploy and it does small very very fishy. I am surprised that no one yet talked about this point. The alternative offered by a group of conservative Republicans is for the federal government to not purchase but to insure the mortgages that comprise these complicated packages. They expect this insurance will allow these banks to value these certificates at par thereby ending the threat to their capital strength by drastic write downs. Their plan calls for insurance premiums to be paid for by the various investment and commercial banks that hold these certificates of participation. The attraction of their plan is if you bought these certificates, you can pay for the insurance that is bailing you out. Another attraction is the federal government will not purchase these investments (at $700 billion); nobody thinks the federal government has any better skill in this than the mortgage bankers. It makes the market work out the solutions, company by company. It puts the responsibility of solving the problem right back on the shoulders of those that got this country into such a mess. I like that. If I were there, I would add a further requirement that these complicated packages be liquidated (a court action will be necessary) and require the sub-prime mortgages that are unfavorable to the home owner borrowers (about 1 to 3% of the total) be rewritten so that the home owners can stay in their homes. Also, I suggest a new accounting standard that investments too complicated to be valued must be carried at one dollar. I heard through the grapevines that wealthy arabs (from the UAE and Qatar) are buying US properties in bundles these days. New York City, Florida, southwest U.S. such as Phoenix area, Colorado ski resorts, southern California and to a lesser extent Boston. Alex, you’re a bad guy! you shouldn’t second guess Israel. What do you think was the reason the Syrians cleaned up the area of this “military facility” so carefully? Whatever happens with microsoft or whomever Bashar is still a brutal dictator. That salient fact remains………..
A big car-bomb explosion near the Damascus airport this morning… at least 17 dead and 14 wounded…!! Syrian tv is saying it was a 200kg bomb and that all the dead were civilians. i came from that road just yesterday when i arrived at damascus airport. It was near Sayyedah Zainab, a most important shrine for Shia, around 7am after Laylat alQadder which the devout spend at mosques and such… so who knows who the target may have been… Iranian… HA… or…?! However, I also heard that the car was headed for the airport and blew up on the way as a result of a car collision accident…! !